I struggle with writer’s block under the weirdest of circumstances. I’m in the middle of a bout currently, and I suspect this time it’s pollen-related. Simply put, I can not think. Mind you, it doesn’t keep me from baking, but I can only summon enough energy to eat what I make; writing about it is out of the question. So I’ve had a little bit of a delay with posts, and for that, I apologize. Having writer’s block does make me appreciate, however, everyone (including quite a few of you) who have real writing jobs which demand, among other things, real deadlines. I remember deadlines. I remember meeting them. I remember thinking I would never be able to meet them. I remember crying in frustration and not being able to write a thing sometimes. Because of that, and my current cage match with spring allergies, I have the fiercest appreciation for those of us who write because we want to, and because we love it, but also because we have a job to finish. Currently, I am super proud of Brianne over at Documenting Our Dinner, who just, just like, today, successfully defended her thesis, thereby earning her Masters degree. In my book, she is already awesome, but to devote that much time and energy to something like that is quite an achievement in and of itself. I got to know Brianne over our mutual love of all things Momofuku Milk Bar. I also happen to know she likes blueberries. I have been trying to make a good blueberry muffin recipe for months now, and so far, the recipes I tried had fallen short of what I wanted. I knew her thesis defense was coming up soon, so I decided to go all in and “Momofuku” a blueberry muffin recipe specifically for her. I failed the first few attempts. I came close with a version (a photo of which ended up on my Facebook page) that tasted pretty delicious, but looked weird and ended up a little too much on the dense side of things. Like, actually heavy after the first day. I was frustrated. I had no idea if I’d make my “deadline” or not, but then; successful muffins emerged from my oven. You see those lumps in the batter there? those aren’t lumps of flour in the batter…those are lumps of Momofuku Milk Bar Pie Crumb, which are used both in the muffins and on top. They really give the muffins a “pie-ish” taste versus a normal blueberry muffin. The second layer of pie-ishness comes from taking some of the blueberries and breaking them down with a bit of sugar in a saucepan to make a blueberry jam/pie filling. Rather than mixing it in completely to your muffins (and producing purple muffins), you swirl it into the batter right before it goes into the oven. The pie crumb topping really makes the whole thing come together. It gives a nice little crunch and texture to a very fruit-filled, dense muffin. And I should mention something very important: just because these are blueberry pie muffins doesn’t mean they should only be eaten for dessert. These would be absolutely perfect for breakfast. So these muffins were a win/win: I made my deadline for Brianne’s thesis defense (well, sort of; they were baked before the big day, just not written about) and I finally found my perfect blueberry muffin. 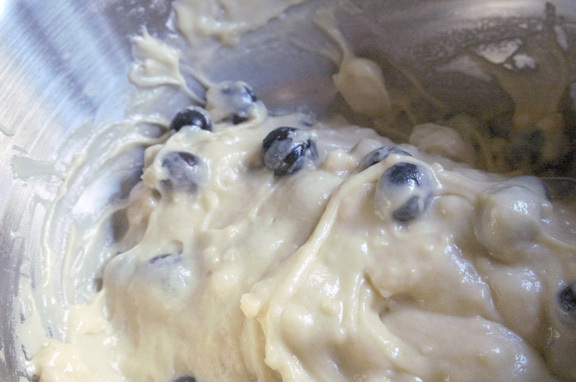 And – bonus – you get the recipe, so hopefully this can be your perfect blueberry muffin too. 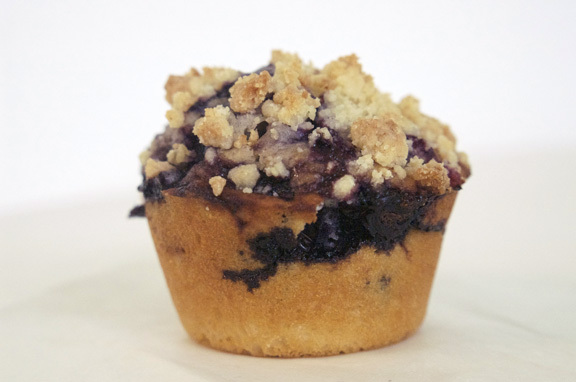 This muffin consists of two recipes; one for the pie crumb and one for the blueberry muffin itself. Would this muffin be scrumptious without the pie crumb? Yes it would – I tried it when I started messing with this muffin project. But it won’t have nearly as much blueberry pie taste to it as you’ll get by including the pie crumb. As further incentive to make both, any leftover pie crumb you have makes the best snack ever, so you have that to look forward to. Pie Crumb adapted from the Momofuku Milk Bar Cookbook by Christina Tosi. Blueberry Muffin recipe adapted from The Complete America’s Test Kitchen TV Show Cookbook 2001-2010 by the editors at America’s Test Kitchen. Combine the flour, sugar and salt in the bowl of a stand mixer fitted with the paddle attachment and paddle on low speed until well mixed. Add the butter and water and paddle on low speed until the mixture starts to come together in small clusters. Alternately, you can do this in a large bowl using a whisk to whisk together your dry ingredients. Add the butter and water and, using a spatula, toss until the mixture starts to come together into clusters. Then use your fingers and mix together, breaking up large clumps and kneading the mixture together until it is fully incorporated and in small clusters. Spread the clusters on your prepared sheet pan. Bake for 18-20 minutes, breaking your crumbs up about halfway through baking. When done, the crumbs should be very slightly golden brown and still a little moist to the touch; they will dry and harden as they cool. 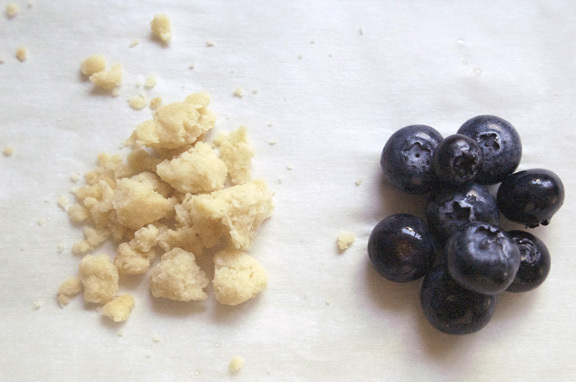 Let the crumbs cool completely before using in a recipe or eating. Stored in an airtight container, the crumbs will keep fresh for 1 week at room temperature or 1 month in the fridge or freezer. The recipe yields a little over 2 1/2 cups of crumb, so you’ll have plenty for the recipe and a little left over for snacking. Preheat oven to 425˚F. Spray a standard-sized muffin pan with vegetable oil spray or grease muffin cups with butter. Bring 1 1/4 cups blueberries and the 1 teaspoon sugar to a simmer in a small saucepan over medium heat. Cook, mashing the berries with a spoon several times and stirring frequently, until the berries have broken down and the mixture is thickened and reduced to about 1/3 cup, 6 or so minutes. Transfer to a small bowl and cool to room temperature, about 15 minutes, which should be just enough time to make the muffins. Whisk the flour, baking powder, and salt together in a large bowl. Whisk the remaining 1 cup sugar and the eggs together in a large bowl until thick and homogenous, about 45 seconds. Slowly whisk in the butter and oil until combined. Add buttermilk and vanilla and whisk until fully incorporated. Add the flour mixture and whisk until moistened and no large clumps of flour remain (batter will be a little lumpy, don’t worry about that). Fold in the un-jammed blueberries, stirring until evenly distributed. Add your pie crumb last, folding it into the mixture until evenly distributed as well. Using an ice cream scoop or large spoon, divide the batter into the cups, filling a little over 3/4 of the way full. Note: the only downside, if you can even call it a downside, is that adding the pie crumb will make your batter bigger and your yield higher. 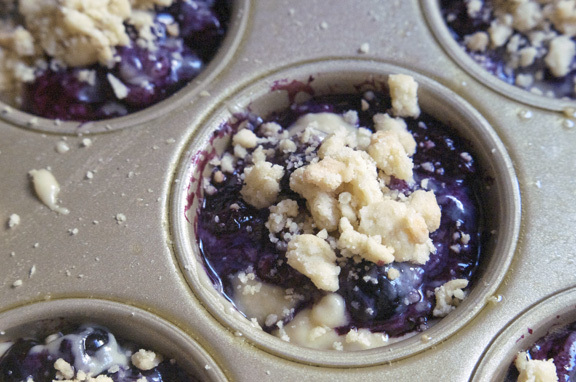 So you’ll have batter left over after filling your muffin tin once. 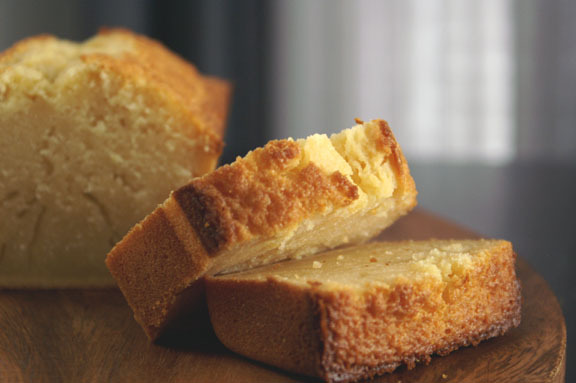 You’ll probably end up baking a little half-batch subsequent to your original dozen. pity. Spoon about 1 teaspoon of the blueberry jam into the center of your muffins. 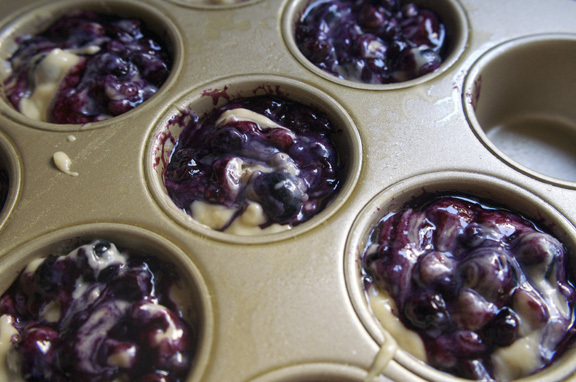 Using a skewer, swirl the blueberry jam around and into your muffins, using an up/down figure-eight pattern. Or however you normally swirl things. Sprinkle the desired amount of pie crumb on top of your muffins. Bake in the oven until muffin tops are golden and muffins are cooked through, about 17-18 minutes, checking at the 15-minute mark and rotating the pan halfway through baking. Cool the muffins in the pan for about 10 minutes, then using a thin-blade knife, gently ease your muffins out of the pan and transfer them to a wire rack to cool completely. Don’t forget about your muffins cooling in the pan: if you let them cool for too long, any excess blueberry jam will solidify and stick to the sides, making it more difficult to remove your muffins. Makes about 16 muffins, or thereabouts, depending on full you fill your muffin cups. 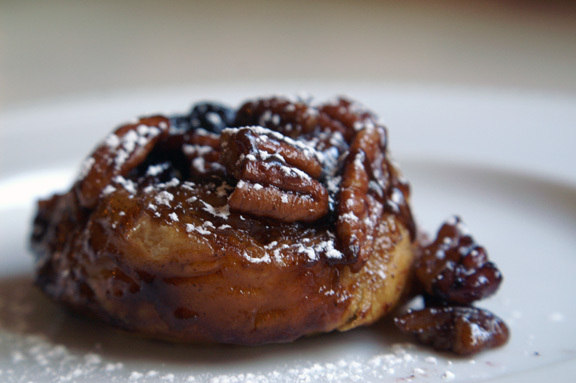 blueberry + pecan sticky buns. 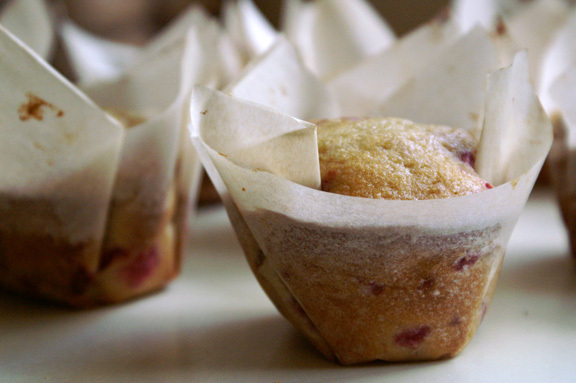 monday bites: raspberry lemon buttermilk muffins. Congrats to Brianne!!!! I didn’t have to do a thesis! I had to do a Master’s Project and pass an exam and I got to bow out of my thesis if I did those two things, so kudos to you! And to you, Shannon, what in the fuku have you done now??? You SO did not go there. I sort of want to drop to my knees and give ya’ one of those bowing/worship things. Also, I’m typing this in an allegra-induced haze (because Texas has pollen, yo!) so if nothing makes sense, I apologize. woot! i’m proud/stand in admiration of anyone who’s done anything to earn their Masters. i have a bachelors and that was difficult enough (and i really like school). what the fuku, indeed, my friend. I DID go there. it was only a matter of time before i started throwing momofuku crumbs and crunches into everything. oh, lordy, does Texas have like, HUGE pollen? 🙂 i feel like that too…i’ve been typing away on my next post and then thinking “um…what?” i also apologize for probably my next 5-7 posts. Oh my foodness! Those muffins sound absolutely amazing. I’ve been battling writer’s block as of late – I wonder if these muffins might help? Because I just, ahem, ate some Campbell’s chicken noodle soup chased by Cadbury mini eggs for lunch… and I’m thinking blueberry pie muffins would have been a far better choice. are we all collectively in a writer’s block/food funk right now? I’ve had more people say the same thing to me (with their own versions of the campbell’s chicken noodle/cadbury mini egg combo lunch); must be a spring thing. My own lunch consisted of coconut macaroons and well…coconut macaroons. perhaps the blueberry pie muffins would have been a better choice. i’m so embarrassed about my lunch now. I normally eat salads and healthy green things…oh, the humanity. Yay Brianne – I don’t know how she managed to bake all the deliciousness that she did; I made one thing for my defense and I could barely do that! someone’s going to have to, at some point, fill me in on this whole “we make food parties when we defend” thing. i had no idea food went along with earning a degree! thanks emma! and yes; i’ve seen the weird purpleish hue some muffins get from blueberries, and i was worried about that a little, but none of them came out looking like strange grapes. 🙂 and you guys and your wild blueberries; MAN do i get jealous of that. OH MY GOSH THIS IS THE MOST PERFECT MUFFIN IN ALL THE LAND!!!!! Now that my extreme excitement is out of the way, THANK YOU for creating such a delectable delight in my honor. I have yet to conquer any crumb recipes from Milk Bar, but now I have the greatest reason ever to do so! These look absolutely wonderful. I hope you feel better soon! Stupid allergies. i’m so happy you like it! i should thank you for being my inspiration for this muffin; we’ve been enjoying these for days now and i think you get a big “thanks” from my family, too. i love the crumbs in the Momofuku book; so easy to make and they really do add a lot to the recipes they’re in. still sort of in a pollen-funk, but getting better…SUCH a gross time of year. congrats again! hm, breakfast potluck next week at work… wonder if i made them the night before if any of them would last to morning…. oh, natalie, i doubt it; you better make a double batch. 🙂 just to be safe. Hi, Shannon. I’m stopping by to give you the versatile blogger award. I love your site and all of your recipes. You’re so talented. Keep on whipping up deliciousness. Thanks for sharing. eeee! you have bestowed upon me my first award! oh wait; maybe i shouldn’t say that, because there’s a good chance i never get another one, sooo…you have bestowed upon me my only award! thank you, Jennie! thank you for thinking of me. i’ll do my best to be worthy. I feel everyone who writes gets writer’s block some time or the other. There are so many days when I haven’t got the slightest clue of what to write about with my recipes. I’m not fond of posting just plain recipes, so there have been weeks when I’ve postponed bunches of posts just because I didn’t know what to write with them and eventually those just went into a black hole. Sigh. So, HUGS to you, my friend. We’re all in this together! 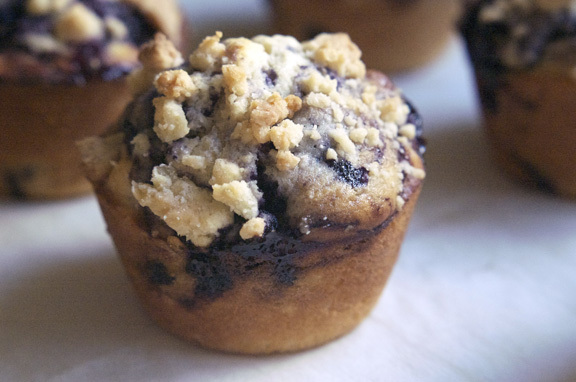 These blueberry muffins…they are awesome! I so have to jump on this Momofuku train because I’ve heard and seen such amazing things about them. I need that kind of yumminess! oh, amrita, thank you for the hugs and your words! i hate writer’s block, hate hate HATE it, and i’m the same way; i stockpile posts and then i don’t know what to do with them (sigh). then i start to feel like i’m the only one who can’t write about like, cake, and i get even more frustrated. it’s so nice when you know you’re not in it alone and your friends have the same issues. you make me feel better! the momofuku book is well on its way to becoming my favorite cookbook of the year, for the incredible recipes and for the inspiration and new way of looking at things it has provided. i’m in love with it. Those look incredible, and I love the crumble on top! Yum! I love blueberry muffins! (Even the Jiffy boxed mix with the fake blueberries!) Your version looks absolutely beautiful and amazing. I want some of these so bad! there’s nothing wrong with a box blueberry muffin, i agree! I love the Jiffy kind too, and i think Martha White has a really good one as well. thank you, renee! Excuse me while I pick myself up off the floor. These are head trauma worthy! thanks Laura! i couldn’t help but to share them, especially with a daily muffin-eater. i’ve been looking for one of those “wow” blueberry muffin recipes forever it seems like, and got so disappointed when i tried recipes that looked awesome but fell short in flavor or texture (or both). And that made me sad every time, because blueberries are one of my most favorite fruits, and they deserved better. finally, i’ve given them a good home. 🙂 i hope you love them as much as i do.